Hi a new figure has finally arrived, after a lot of anime related posts I can present you a new figure review. 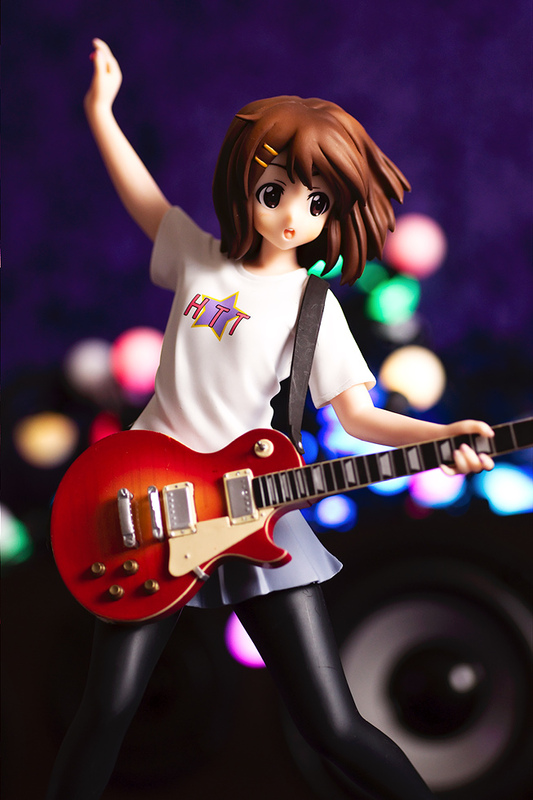 Today it will be about Hirasawa Yui, she’s a premiun prize figure manufactured by SEGA. I never thought about buying a Sega figure before, last year, I began to notice, that their quality seemed to be better than I actually thought. 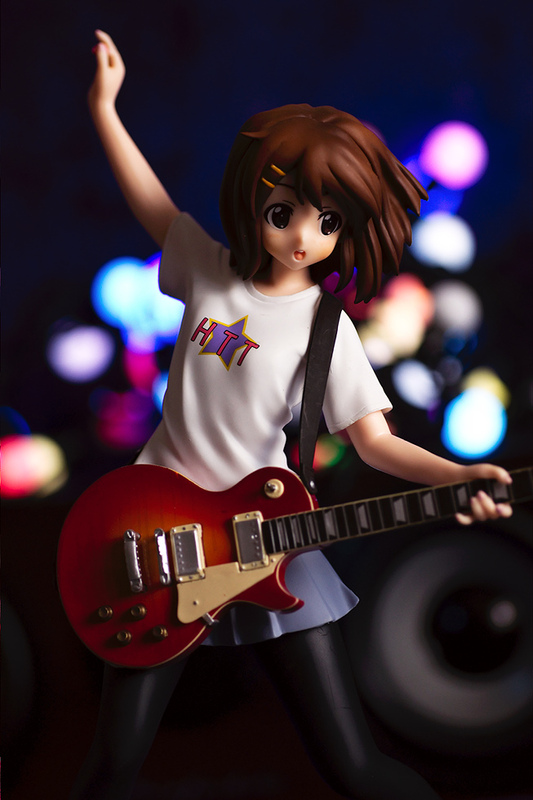 I couldn’t find this Yui figure at japanese shops and ordered this figure at an US-shop, later she appeared on Mandarake for around 1600 Yen, I paid a little bit more, 35 $ + shipping (rage! 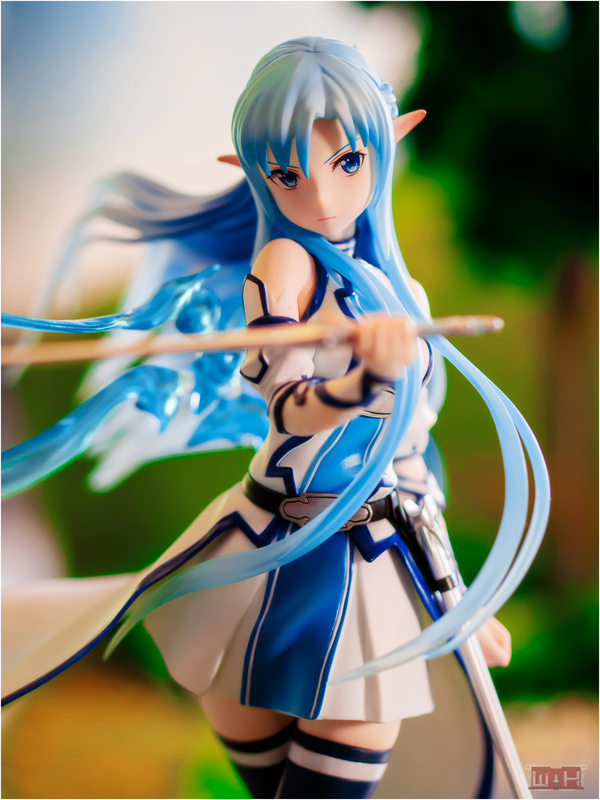 ), for prize figures you should give Mandarake a try. 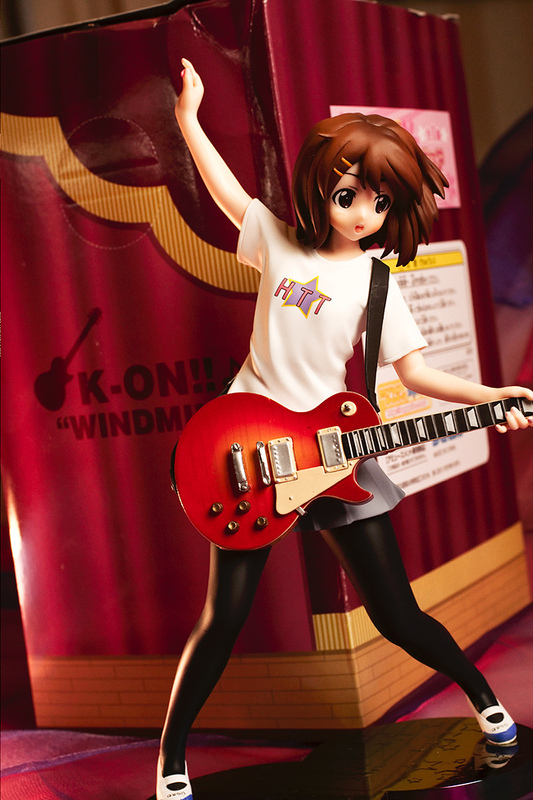 Despite beeing a prize figure Yui comes with a nice looking box, she is a fully assembled figure, already fixed on her flip-flop colored base and with her beloved guitar “gitah” in her hands. As I first unpacked her I felt a bit dissapointed with her, Yui was so unexpectedly big, I expected something more close to 1/8. Because of the huge size the lack of details on this prize figure is very prominent. I guess I became a bit spoiled with the level of detail from my high price figures. 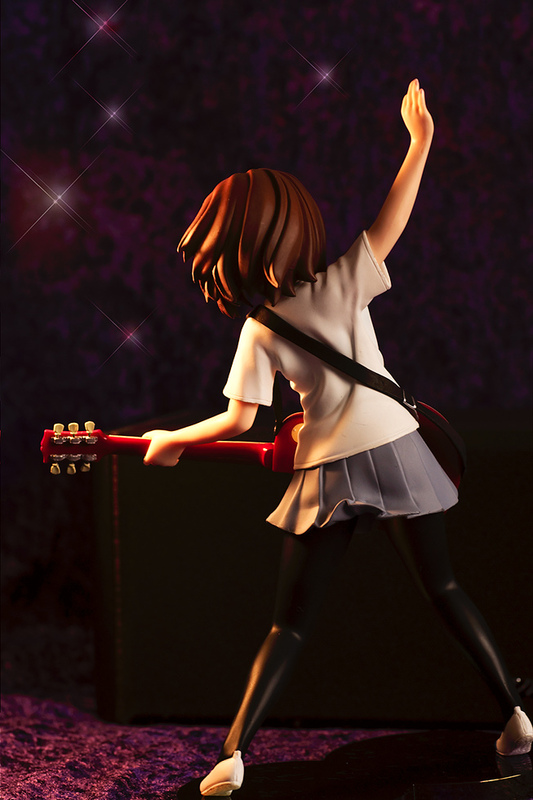 Well, while doing the shooting with Yui, I slowly got the feeling that Yui actually is a very nice looking figure and that I was too harsh with her at the beginning even though there is still a difference in comparison with figures from other manufacturers that have a higher reputation. 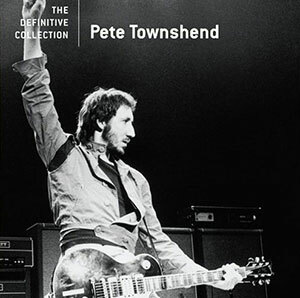 As you see this is a quite dynamic pose SEGA had chosen for her, I think they wanted to recreate the trademark windmill move of Pete Townshend, a member of The Who, he also owned the same Gibson Les Paul guitar like Yui, in fact he had 9 different Les Paul guitars for the concerts. 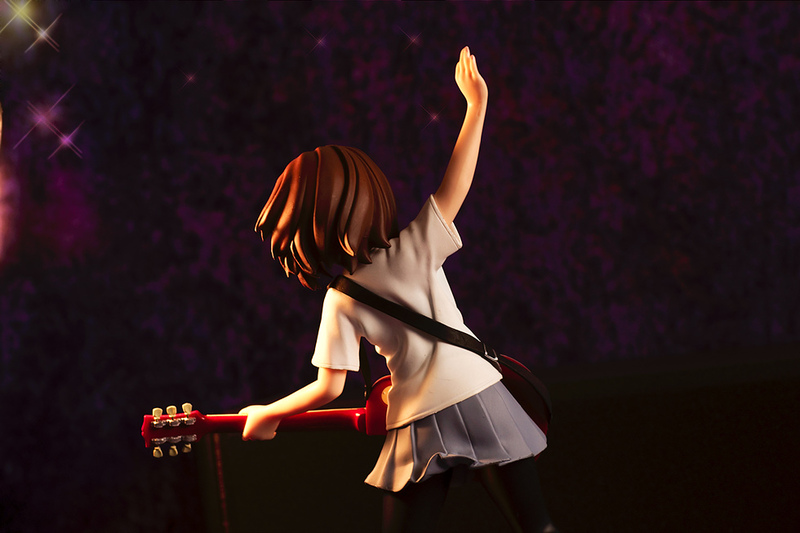 Yui raises her plektrum in the air like she wants to ROCK!, her movement with the spread and slightly crooked legs is captured very nicely, well her back is more leaned forward, but thats mainly because of the weight of her guitar, I suppose it’s a quite heavy instrument for a girl of her size. 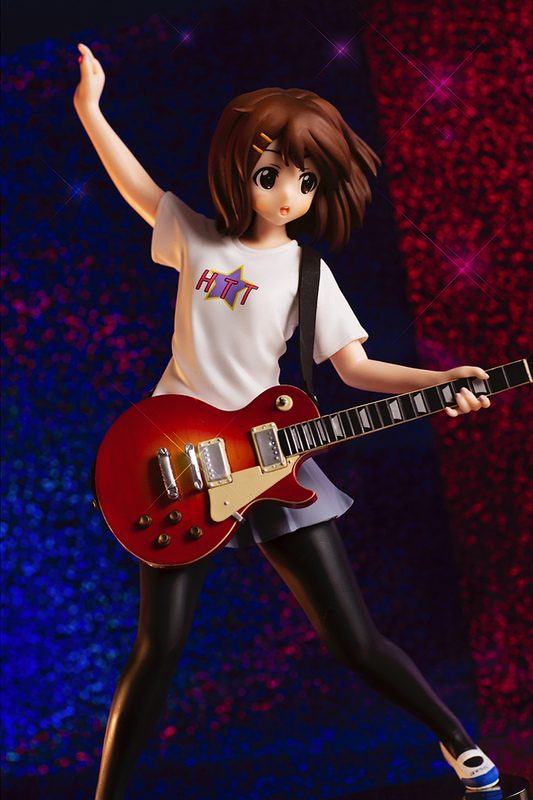 Yui’s guitar is the Les Paul Standard Sunburst made by Gibson, they did a very good job in recreating the details of this popular guitar model, the plastic has a nice polished wooden look, the turning knobs are on the right placed and also the belt around Yui’s shoulder looks cool. 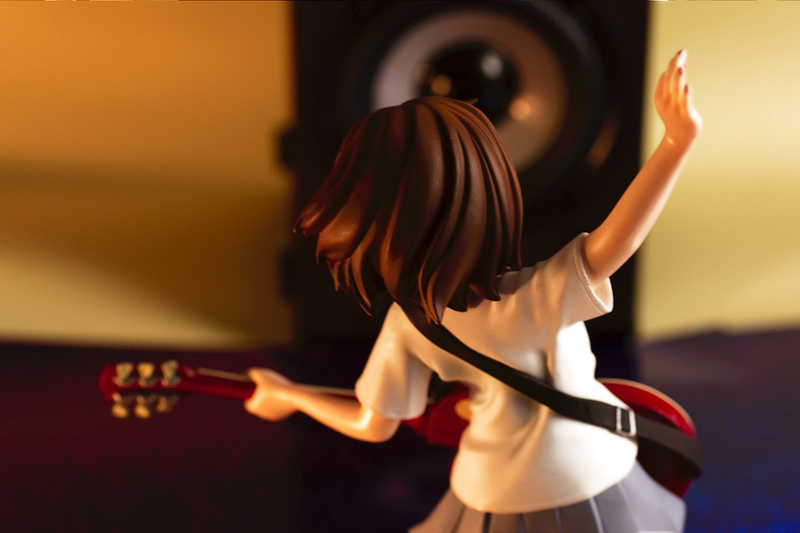 Yui has a wild waving hairstyle with several detailed strands and her 2 yellow clasps. There are also some shading effects which have been rarely used on the rest of this figure. They gave her face a nice open mouth and some cute blushmarks and nice eyes, overall she resembles Yui very well, maybe her eyes appear a bit too big in comparison with her face, what do you think? 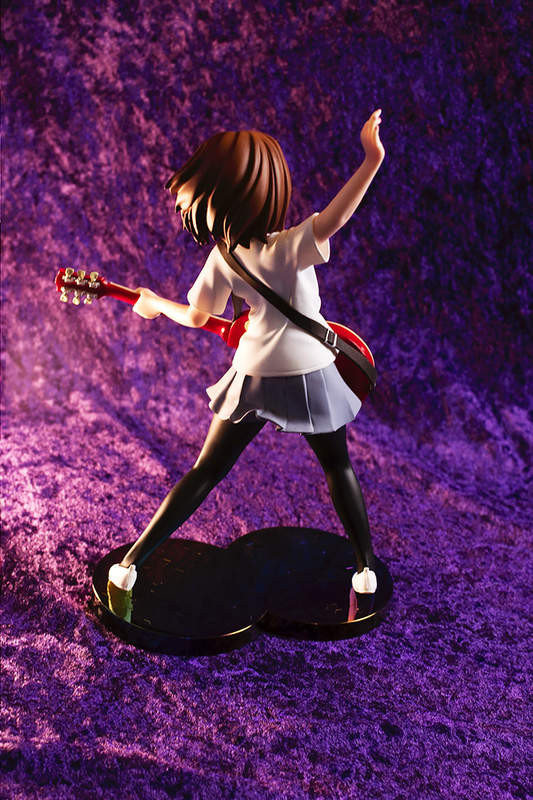 The reason why I have ordered this figure adaption and not one of the other Yui’s is mainly based on this cool looking pose and partly based on my aversion to western styled private school uniforms, they are so plain and bourgeois. With the white HTT t-shirt her outfit has more credibility, now she really looks like a member of a band. Thats the spirit of Rock n’ Roll! Well, Im ok with the skirt and her black pantyhose, since they accentuate her nice legs. Also the sculpting of her dress with the detailed wrinkles on skirt and shirt is very well done. There are nearly no visible seamlines, also the simple paintjob looks clean and smooth. 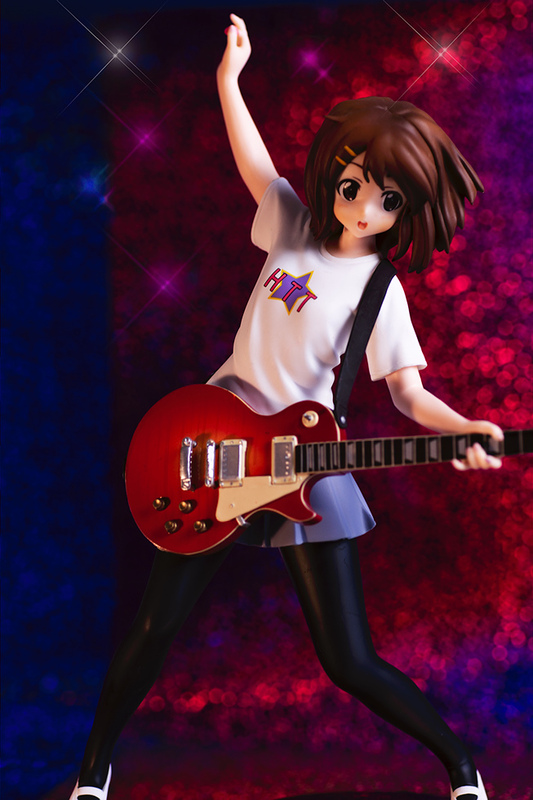 Yui is a premium prize figure and in terms of quality she’s actually a very good figure. At first I was a bit dissapointed because of her big size, but after the shooting and some days on my desk, she grow on me a bit more. 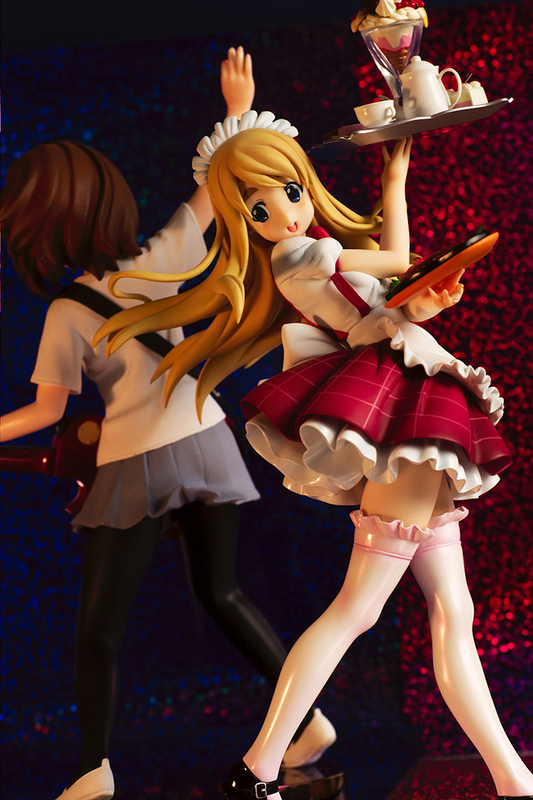 Well, you can clearly see where Sega cut the budget for prize figure Yui, aside from the hair this figure has no shading and the good sculpted guitar has no strings, nevertheless it’s remarkable, that a prize figure comes with such a good quality. Well for the price I’ve paid I would had expected a decent figure, but when you’ve just paid 1500 Yen this is more than a very good deal. She looks so cute here. I like your pictures, by the way, especially the ones with sparkly background. 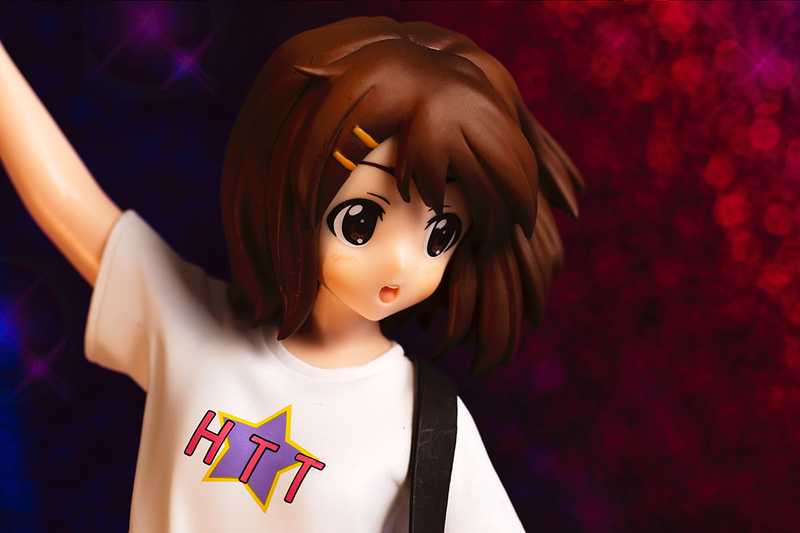 Yui is a cute figure the wild hair together with her pose is such a good combination. I’ve noticed that prize figures have been getting better in terms of quality over the last few years. I guess it’s to compete with the more expensive quality figures with a decent and cheaper alternative. 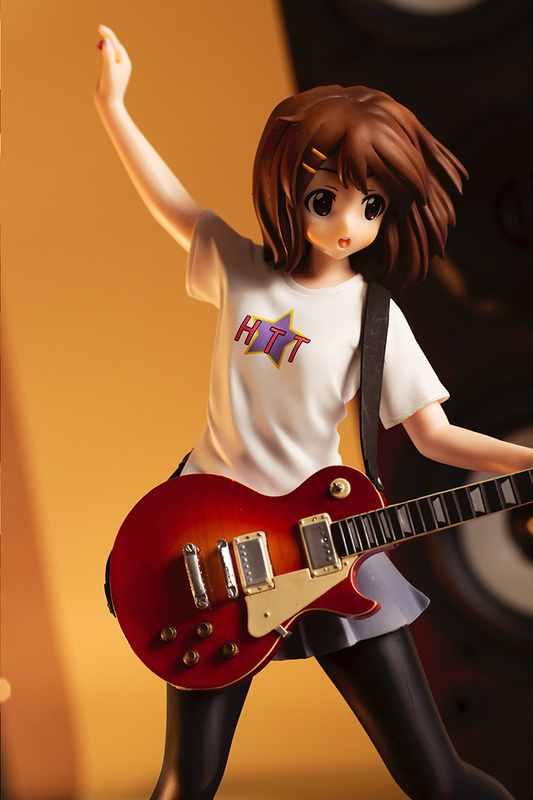 I’m impressed with the details on Yui’s guitar, that’s something I would expect to see on a more expensive figure.